With the U.S. Senate out of session, Sen. Jeff Flake­­­­­­­­ spent much of the month visiting constituents around the state. Friday he met with Maricopa and Ak-Chin Indian Community officials in Maricopa. Nearly 50 people representing the Ak-Chin community, city of Maricopa, Maricopa Unified School District and other public officials attended a luncheon at the Elements Event Center at Ak-Chin Circle. Flake met with city officials at Copper Sky Multigenerational Complex prior to lunch and took a tour of UltraStar Multi-tainment Center afterward. Flake was welcomed to the stage by Ak-Chin Indian Community Vice-Chairman Delia M. Carlyle and Maricopa Mayor Christian Price. 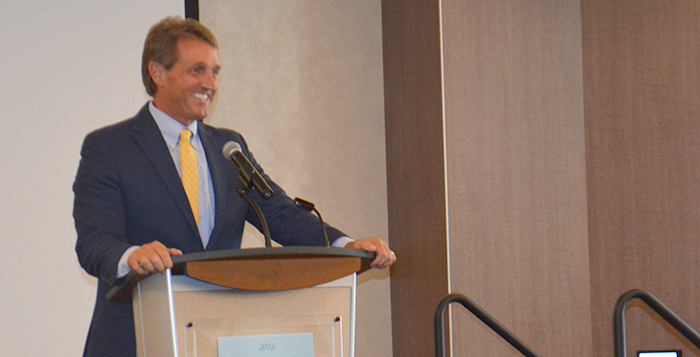 Referencing Ak-Chin’s strong ties to agriculture, Flake started his speech with an anecdote about his childhood growing up in a farming community. When he was 5, Flake said he stuck his finger “where he shouldn’t have” and lost the tip. However, his father re-attached it by wrapping it with a handkerchief, but finished his job before taking the younger Flake to the hospital. The story was received with laughter, and the light mood lasted throughout the event. Flake addressed the water shortage in Lake Mead and new regulations that could directly affect agricultural in the area and electricity rates. Flake said Arizona needs to improve the thinning of the forests to help improve the gathering of rainwater as well. He estimated 23 percent of rainwater is lost due to forest overgrowth. Flake also addressed foreign policy. He said the Obama Administration should have held Iran accountable for more than just its nuclear weapons program, but he will support the Iran nuclear deal if it is ratified. Flake doubts there are enough votes in Congress to prevent it from moving forward. The senator from Snowflake, Arizona, expressed his support of lifting sanctions against Cuba due to the economic boost it would provide American exports and the Cuban people. Flake will return to Washington, D.C., when the Senate reconvenes Sept. 8.